← Sitting in Toronto, reading James…. A glorious view welcomed us this morning. Late last night, we drove into Giv’at Ye’arim in the dark and, after a Pink Panther-esque car parade through the village, several times, we found the house we have rented. Situated high in the hills west of Jerusalem, we have a wonderful view of mountains and rooftops. We were starving and the cupboards were bare, but patiently we listened to our excited host who showed us every nook and cranny while giving abundant detail for things to do and benefits of this location. 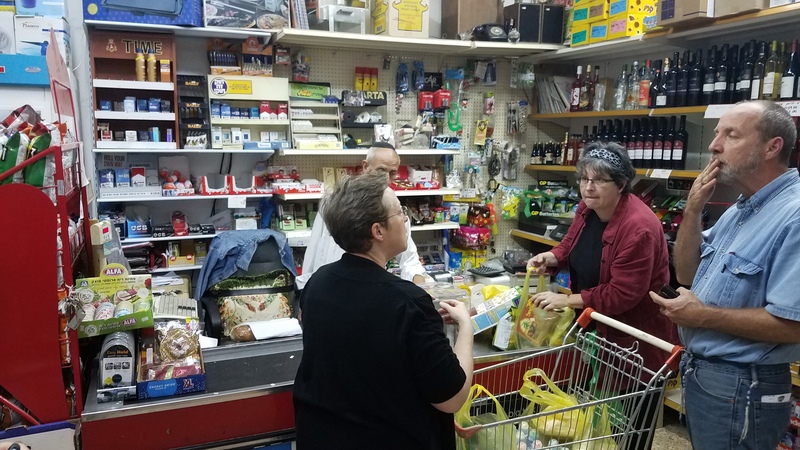 Once he realized we needed dinner, he phoned a friend and then led us to the village shook (market) where we loaded up a grocery cart with supplies to hold us through breakfast and today’s trip to a much larger market. Upon our return from the market and getting luggage unloaded into the respective rooms, we began opening the various cans, jars and containers for a wonderful antipasto/tappas dinner. Olives, three cheeses, bread, sardines, dates, crackers, hummus and fruit as well as wine really hit the spot. The ladies gathered around the table and the men retired to the cool open air porch to bask in the tired glow of finished travel and discuss the coming week’s plans. About midnight, after showers, we crashed. Hard. I could hear voices and rolled over to sun streaming in our bedroom window. My cell clock said I had slept for eight hours and I am not sure I even moved. I got up. I mean, tired or not, who can lay in bed when you wake up in Israel! There is so much to see/do/explore!! Al was already up and blogging a quick post about our location and view! After rapidly dressing and washing my face, I had to get on the first order of business for the day: COFFEE!!! One of the great adventures of traveling is figuring out seemingly simple tasks. With no coffeemaker or percolator, I had to start thinking before my caffeine injection! The final work-around was a water heating teapot followed by slowly pouring the water through a coffee filled screen into another tiny teapot. The smallness of size demanded that I aim almost for a cappuccino consistency since there were five or six kafe drinkers eyeballing me. The remaining challenge was that the house has no mugs! But, good wine and good coffee, being related, I figured the small goblets would suffice for the dark rich goodness from the tiny pot. The result was an amazing first morning on the porch not unlike last year’s breakfast overlooking the Mediterranean from the rooftop of the Hotel Gilgal in Tel Aviv. Today is to be a light day of rest and shopping as we get set up for the next 12 here in Gibeah. I have a return trip to Ben Gurion Airport this afternoon to pick up friend, Tom Lewis, who will be spending Shabbat with us before joining his group. Somewhere in here we’ll have to get some shwarma. Off to enjoy the day, but excited to share as much as I can with you in hopes that you, too, will make the effort to come to the Land!! 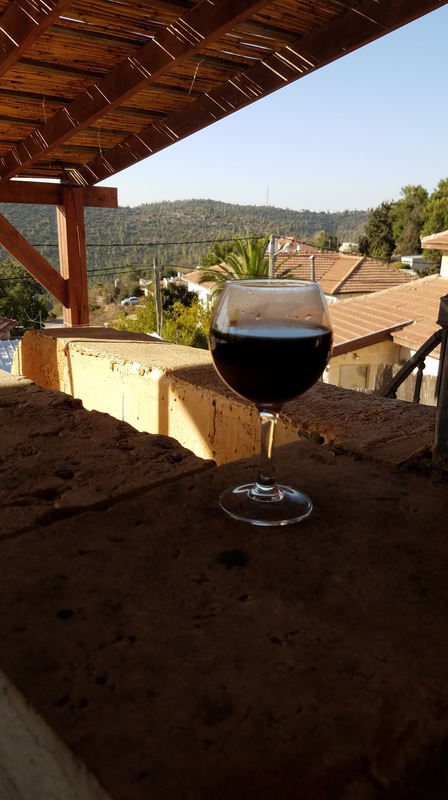 This entry was posted in Travel and tagged coffee, Israel, Jerusalem, porch, travel, view. Bookmark the permalink. This is a very good and even Biblical jealousy to arouse in my very dear brother!! Wish you and your whole family were here! Someday I will return – hopefully with at least part of the family. In the meantime, eat lots of shawarma and Falafel for me! Shalom. You and Al are making it so fun for us who did not get to go! Oh my! My feet are already anticipating the time to go. 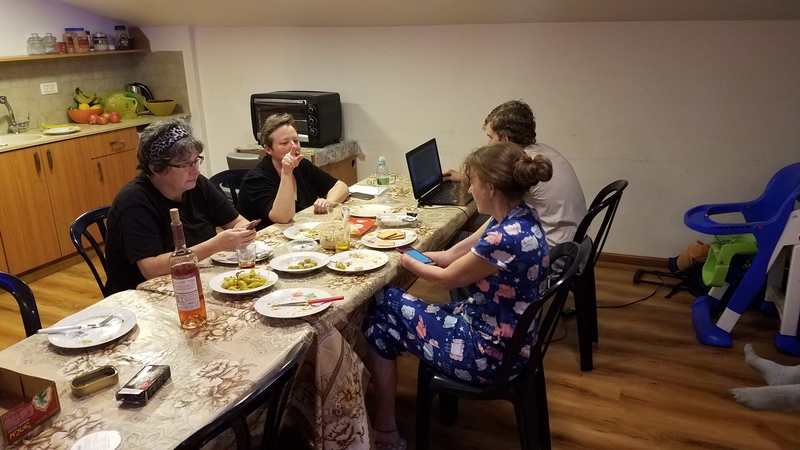 What wonderful food and fellowship I get to remember till…….